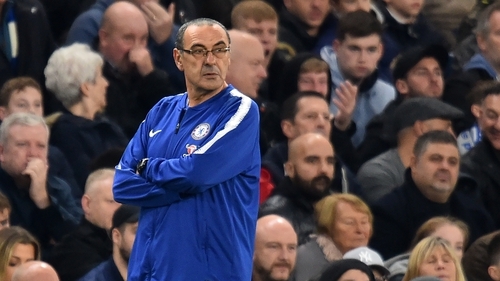 Manchester City and Liverpool remain the teams to beat but Chelsea are closing the gap, manager Maurizio Sarri said after his side extended their unbeaten start to the season to 11 games with a 3-1 win against Crystal Palace on Sunday. The astute Italian insists his side still have some way to go but Chelsea's improvement under the master tactician this season has been nothing short of startling. The Blues laboured to fifth-place and finished 30 points behind champions City last season; playing underwhelming football throughout a campaign the was overshadowed by reports of rift between Chelsea players and former manager Antonio Conte. But since arriving from Napoli in July, Sarri has lifted the mood at Stamford Bridge and transformed a Chelsea side into one of the most potent attacking sides in Europe. After almost one third of the season, they trail leaders City by only two points. Along with City and third-placed Liverpool, Chelsea remain unbeaten after 11 games with Sarri equalling the longest unbeaten start by a new Premier League manager -- set by Nottingham Forest's Frank Clark in 1994. "Manchester City and Liverpool are at the moment a step ahead of us," Sarri told Sky Sports even though Chelsea are ahead of Jurgen Klopp's side on goal difference. "When I arrived the gap from last season was 30 points with City. It is difficult to think you can recover this gap in one season, or in six months. We need to improve more because we are doing well." Such has been Chelsea's form this season, they were expected to make light work of a Crystal Palace side who had won just twice in their opening 10 fixtures. However, midway through the second half a spirited Palace side were holding the Blues, but a brace of goals from the improving Alvaro Morata and an impressive cameo from returning talisman Eden Hazard saw them canter home. "We were a little bit in trouble so we needed some quality and personality," Sarri continued. "We were lucky because we had Eden on the bench. He was able to immediately change the match. "I am really very happy for Alvaro. He improved in the last month in confidence and personality. He improved also from a tactical and technical point of view. He plays with more continuity from the team. "He has great potential physically and technically. He can improve more. Potentially he can be (a top striker at a top club)."